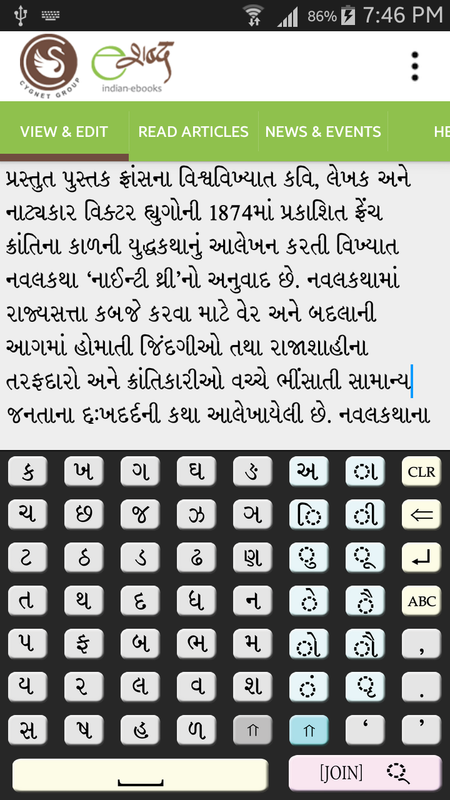 Gujarati e-Shabda app is available on Android play store. e-Shabda strives to take maximum advantage of existing and emerging technologies to enable more and more Gujaratis to stay connected with their mother tongue. Having more than 500 Gujarati eBooks — that too having highest literary quality, authored by some stalwarts of our language, e-Shabda has already started a revolution for Gujarati literature. Very soon this number will increase exponentially and you will be able to read books by any of your favorite author in form of a Gujarati eBook. Gujaratis love to communicate in their own language on mobile devices but manufacturers, for reasons best known to themselves, are falling behind in providing Gujarati support on phones and tablets. e-Shabda Gujarati app is an attempt to fill that gap. If your phone does not support Gujarati font, and you cannot read Gujarati message received in Whatsapp, Facebook or e-mail, you can copy that message from that app, paste it in e-Shabda app and read it easily in one of the best font prevalent in Gujarati publishing industry. 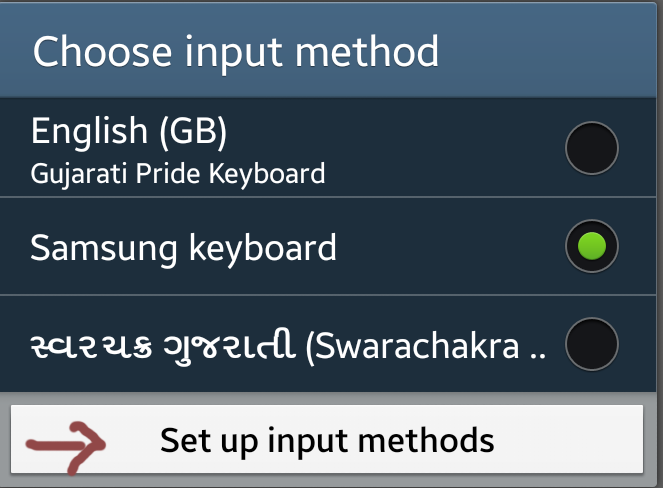 Not only that, you get a support of simple, intuitive Gujarati keyboard to type in Gujarati, you can copy that text and paste in any other apps on your mobile. Typing using Gujarati keyboard also helps you in learning your language better without any extra effort! Not only that, the same app can be used to read large number of Gujarati articles/blogs having audio-visual content posted on e-Shabda website. Very soon we plan to add many more interesting and useful free features. Your feedback and feature request is most welcome. 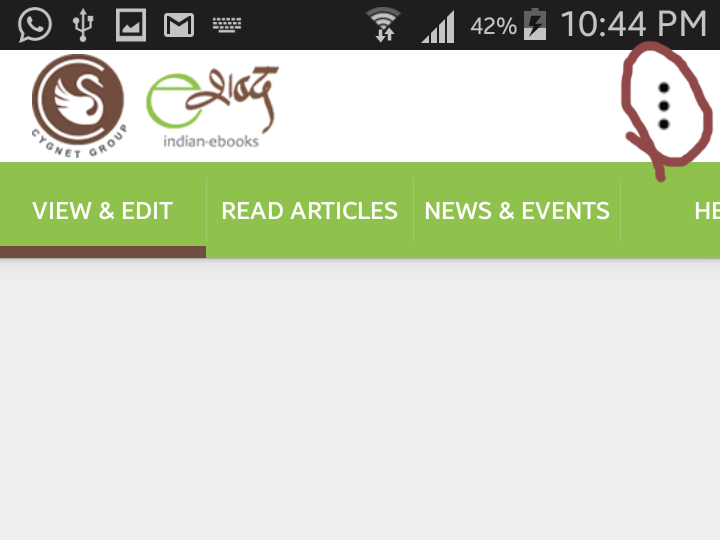 View & Edit: this is the tab where you can read or type Gujarati text. Read Articles: you can read free blogs/articles from www.e-Shabda.com/blog. News & Events: in this tab you will be able to see upcoming events and news related to Gujarati literature and culture. Help: instructions and help for using the app. There is an application menu which can be activated by pressing “three dots” as shown in the illustration. On some devices this appears in top right corner whereas on some it may appear in notification area. And in almost all Android devices there is a softkey for accessing the menu. Change Keyboard: Accesses the system settings for changing keyboard. If you want to change between e-Shabda keyboard and system keyboard, use this option. 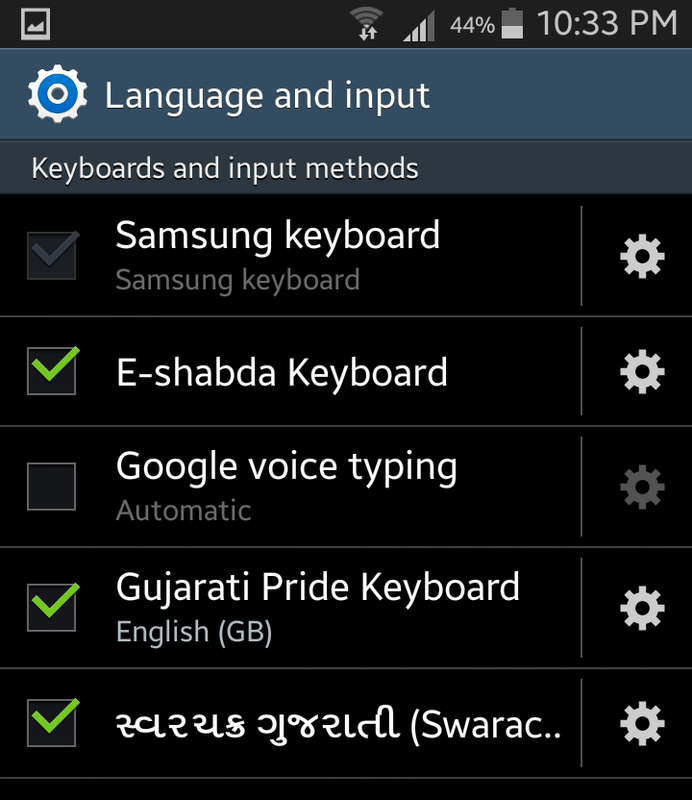 First time after installing the app, you have to use this to enable e-Shabda keyboard. Share Text: Copy all the selected text in the text area and open a list of apps in which this text can be shared. Font+ / Font-: Increase or decrease the font size in text area. Share App: Suggest this app to a friend. Dictionary: Select and copy any word from the text and look up its meaning from Gujarati Dictionary on Gujarati Lexicon Website. 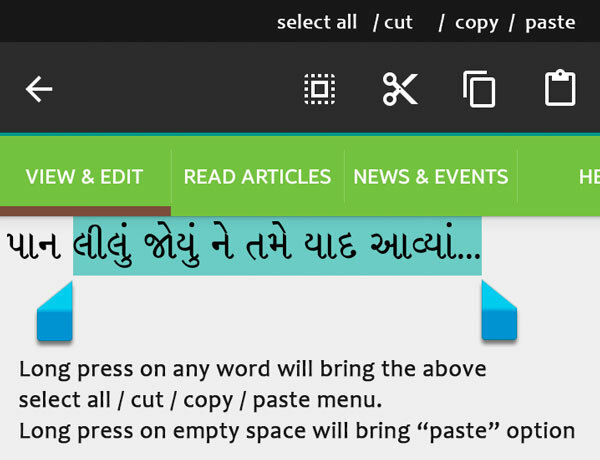 (courtesy: www.gujaratilexicon.com)To do this: simply select a single word by pressing your finger on it, copy it to clipboard and then select “Dictionary” option from this menu. 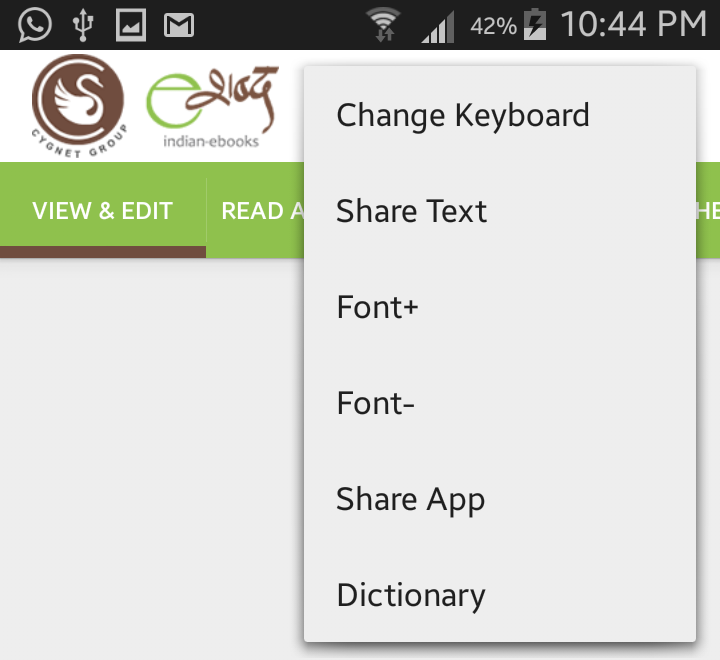 After installing the app, you have to enable the e-Shabda keyboard for the first time by selecting “Change Keyboard” from the menu. You must then select Set up input methods, and tick the e-Shabda keyboard. Now onwards, you will have access to the e-Shabda keyboard in all your applications. Note that you may use any other keyboard also in e-Shabda app. 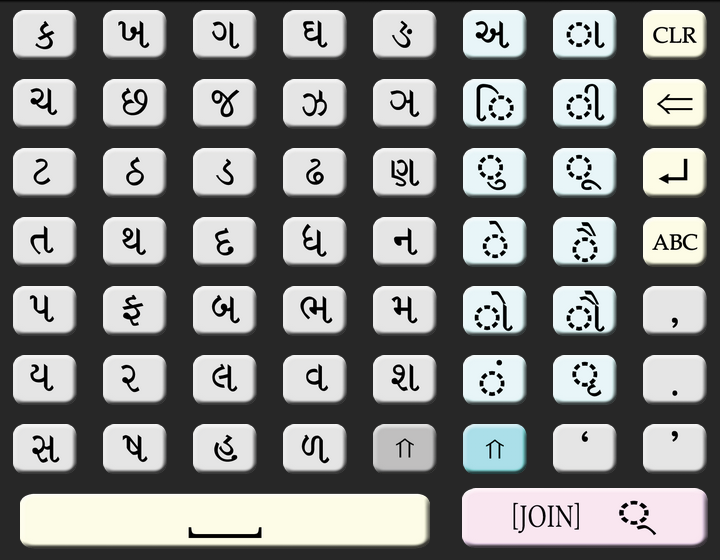 The Gujarati keyboard is very simple and even if you don’t remember the basic alphabets, with little practice, you will be able to type in Gujarati. On left, the basic consonants (વ્યંજનો) are organized in grey color keys. They are arranged in what is known as વર્ગ… If you have forgotten the Gujarati basic characters, looking at this will remind you of the same. On right, vowel matras (સ્વર માત્રાઓ) are present in blue keys. To add them to a letter, simply press them after you type the letter. To type કે press ક and then press ે. But remember here that our languages are phonetic. So if you want to type anything, just press the keys in a sequence that you will pronounce that word. To type વિ don’t type િ followed by વ. Simply type વ first and then matra… િ. On extreme right some control keys are present. CLR for clearing all the data in the entry screen, next is BACKSPACE for removing character left of the cursor, next is ENTER for new line. ABC will allow you to change the keyboard. Comma, Fullstop, Spacebar are self explanatory. JOIN key is used to create jodakshars (જોડાક્ષર). How to create jodakshars is explained in the following section. Both Grey and Blue section of the keypad has one SHIFT key each. Pressing that will bring different letters of the alphabet in those positions. Attached herewith is the illustration of both the alternate keypad areas. Pressing Grey SHIFT key will bring and show the alternate keypad until you press Grey Shift key again. But pressing Blue Shift will show the alternate keys (Full Vowels-અ, આ, ઇ, ઈ, ઉ, ઊ…) for only one keystroke. After one key press, it will automatically return to swar matras. 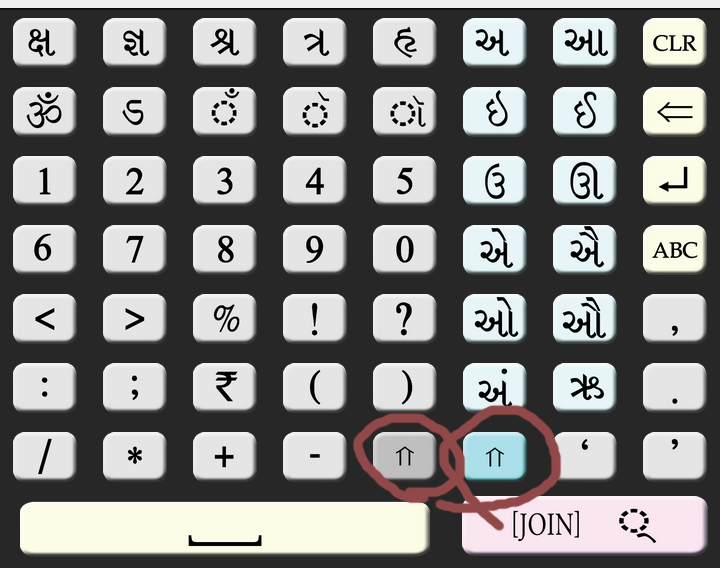 Though, some oft-used ready jodakshars like ક્ષ, જ્ઞ, શ્ર, ત્ર, હૃ are present on the SHIFT Keypad, all of them can be created by joining their original components… Please note that Vowels like એ, ઐ, ઓ, ઔ etc. can be typed by joining અ with matras ે, ો also. But the correct way is to use a full form of that vowel from the SHIFT keypad rather than joining અ with matras… In this keypad we have avoided using Gujarati numbers and we encourage to use English numerals only. Most widely used signs are included, but if you need any more you can change to keyboard and use from all the signs that your phone offers. As explained earlier, Gujarati and almost all our Indian languages are perfectly phonetic, it is written the way it is pronounced (well, almost… we have two exceptions: hrasv-i and ref). So if you know how to speak Gujarati and if you know the basic Gujarati alphabet (કક્કો) then you can type anything in Gujarati. Simply type as you speak: 1. to join two letters press [Join] key between them and 2. To add matras simply press the required matra key after the letter (no need to press [Join]). You must have noticed that પ | [્ Join] | ર automatically created પ્ર and pressing િ after that automatically shifts િ before પ્ર and makes it પ્રિ. Did you notice that ૃ is a matra of the vowel ઋ (કૃષિ, ગૃહ, હૃહય) and also ક્ષ = ક | [્ Join] | ષ and not ક | [્ Join] | શ as some of us thought. ક્ર = ક | [્ Join] | ર, ખ્ર = ખ | [્ Join] | ર, ભ્ર = ભ | [્ Join] | ર, ત્ર = ત | [્ Join] | ર, જ્ર = જ | [્ Join] | ર etc. જ્ઞ = જ | [્ Join] | ઞ did you know this? not ગ | [્ Join] | ન as some of us thought. Character ઞ is pronounced something like ‘nya’ and is not to be confused with letter ગ. If you need any more help on this, do write to me on apurva.ashar@gmail.com.